Cecil Kim, lead concept artist for God of War III, has recorded a new two-part series of training videos on art direction for games for The Gnomon Workshop. 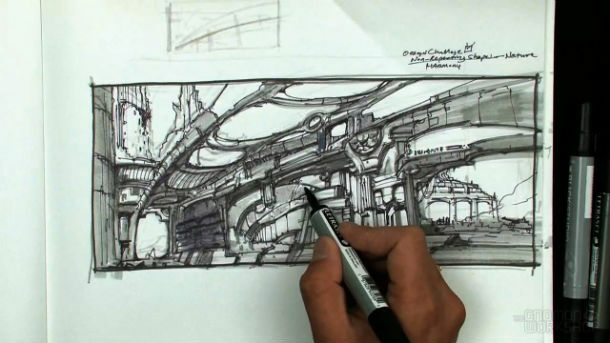 In Volume 1: Ideation Sketching, Kim demonstrates how he produces design options using traditional drawing tools such as markers, pens and pencils, guiding viewers through the creation of eight separate environment designs. During the video, he shows how he establishes a perspective layout, filling it with architectural details, as well as how he designs the surface of the abstract shapes with which he initially starts. In Volume 2: Painting Concepts, Kim takes these sketches and paints them digitally using Photoshop, using basic painting layer techniques to add realism, color and lighting. The video demonstrates how he preserves line drawings, separates value and color in multiple layers and focuses more on readability and defining shapes rather than surface material rendering. This technique enables him to quickly present painting concepts for a production team to review. Both videos cost $59 and are available on DVD or via digital download.